Pronounced “U-M-E,” an acronym for University Method of Education for grades K-12. UME Prep seeks to expand the University Method of Education for Grades K-12 and to serve a wider range of families with greater diversity. In doing this, we are expanding public education options by creating a new kind of public school that will provide students with a unique opportunity for acquiring a high quality, college-preparatory education previously unavailable outside the private school realm. K-12 schools based on the University Method of Education (UME) have been in existence for almost two decades in the private sector, with over 50 private UME schools open across the country (21 in Texas and 9 in the Dallas/Fort Worth vicinity). 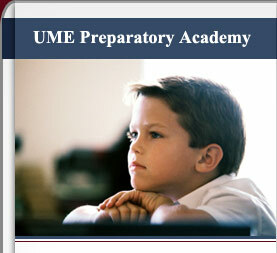 UME Prep is the first public charter UME school to be established. UME Prep seeks to create an innovative and inspirational environment in which students can develop a strong academic work ethic, a solid background in core academic content, and also major intellectual life and career skills. We achieve this through a university method of class scheduling, lower student-to-teacher ratios than required by the state, and a blend of face-to-face and computer/technology-aided classroom instruction. A key component contributing to this environment is our Parent Equipping Program (PEP), where we invite and encourage interested parents to be uniquely involved in their child’s educational experience.